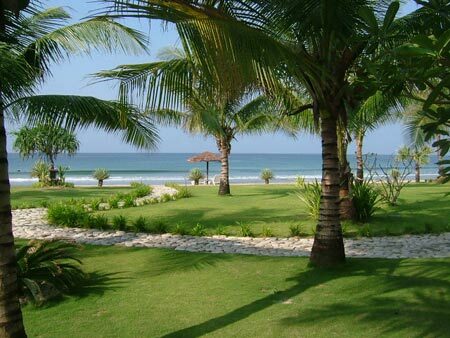 Ngwe Saung Beach Resort is Located in the Ayeyarwaddy Division, about 30 miles west of Pathein. Ngwe Saung, a beach frontage on the Bay of Bengal is unspoiled and pollution-free natural surroundings with its crystal blue waters, its white crested waves, silvery sands and extensive sunshine beaches, is indeed one of the best places for recreation and relaxation. Ngwesaung's silvery beach stretches an unbroken line for 9 miles from Zee-Maw Village in the north to Majee-Maw Village in the south with its scenic and occasionally rocky shoreline, all set against a backdrop of tropical rain forests and the towering Rakhine mountain range. Ngwe Saung is accessible by car (about 5 hours drive) from Yangon via Pathein, 4 hours drive from Yangon to Pathein and cross the Ngawun River over the new bridge, then continue drive about 1 hour to reach Ngwe Saung. There is a wide choice of hotels from basic to international standard in Ngwe Saung. Morning drive to Ngwe Saung Beach. (We provide car, driver and hotel only) Relax at Ngwe Saung Beach. Lunch and Dinner on your own account. Overnight at hotel in Ngwe Saung. Relax at Ngwe Saung Beach. Lunch and Dinner on your own account.